I used to often wonder what would be better than standing on the summit of Mt. Everest? After reaching the top of the world in 2006 and meeting the love of my life, my husband, on the same trip, I worried it might be all downhill from that moment forward? Would I ever be able to replicate my experience on Mount Everest? When I would reflect on what might be better than Everest, nine times out of ten a trip to the moon would be my answer. While I have no aspirations of someday going to the moon, I came to believe that a climb of Mount Mawenzi would be a similar experience. Not only did I envision it being magical in every sense of the imagination, but I foresaw it being one of the most challenging climbs I might ever attempt. It was clear from reading the very old and dated guidebooks that at no moment would there be a trail or even a sign of a footpath to follow. The rock quality was sure to be both foreign and fragile making the chance of success very slim. Of all the mountains in the world, why choose Mawenzi? You know what they say, “There are no coincidences.” How does one go from climbing Mount Everest, to setting one’s site on an obscure obstacle on the African continent. It just so happens that my very first mountain outside of the United States was not too far from Mount Mawenzi. When I learned to rock climb, I had the simple goal to travel to far away mountains and to test my skills climbing moderately rated rock to the top. Mount Kenya was my first choice and she did not disappoint. The entire trip felt like a major expedition as it took months of planning and preparation. The climb itself was full of epic moments as route finding was extremely difficult, weather was unpredictable and tension existed between me and my partner. It was right there on Mount Kenya that my life was thrust onto a new path. I would spend the rest of my life climbing tall mountains and I would explore more of what Africa had to offer. I was hooked and yet, I had learned one of life’s greatest lessons, choose your partners wisely and carefully. The difference between a good experience and a bad experience boils down to who you choose to have on the other end of the rope and who you entrust with your life. When my stepfather learned that my husband Brad was taking a small group up Kilimanjaro in 2010, he asked if he could join. In a matter of days, it was a family affair with my mom tagging along to do a safari. By the time I had climbed Kilimanjaro there was nothing particularly hard about this mountain, but I certainly underestimated how challenging it can be to go to 19,400 feet in such a short number of days. 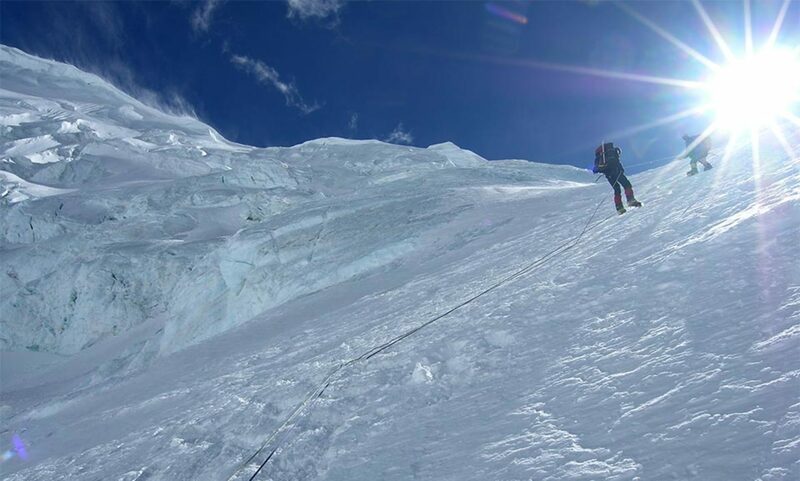 Like all mountains, the summit day was a big undertaking as it required a lot of physical perseverance that resulted in a state of complete physical and emotional exhaustion. I will never forget the last few steps holding my father’s arm as we made our final steps to the top. A second lesson came into focus; real memories do not come from standing on the top. Lasting reflections are etched in one’s mind as a result of all of the trials and tribulations encountered along the way. Our climb of Kilimanjaro took us on a route that had us looking at Mawenzi for multiple days. We must have seen 3 sides of the mountain during our ascent and decent of Kilimanjaro. While these views were spectacular from the ground, nothing compared to the view of Mawenzi from the summit of Kilimanjaro. It is a rugged and jagged peak that truly looked like you could start hiking from any point along the base and find an exciting route to the top. I could see more than 50 ways to climb the mountain. I could not help but think how thrilling it would be to climb a mountain that not had no one else on it and thus no one to follow to the top? This mountain tugged at my heart strings like no other. My husband and I immediately reached out and inquired with the African government if it had been climbed. We were told yes it had indeed been climbed but it was permanently closed 30 years ago due to dangerous rock fall resulting from the warming climate changes. Earlier photos of Mawenzi showed it snow covered, but just like the slow demise of the glaciers on Kilimanjaro, one is hard pressed to find any ice or snow on Mawenzi the majority of the year. I simply filed the thought of climbing this mountain away in the back of my mind and set my mind on climbing other mountains. Every mountaineer knows there is always another mountain to climb, however a tragic accident on Rainier resulted in the loss of a very good friend and shook my confidence to the core. I was faced deciding if I would be able to again find the love and joy in the mountains. As I groveled with my emotions, I desired a mountain escape. It only seemed reasonable to retreat into a region that had no crowds and see what it would feel like to climb again. It did not seem right to ask anyone to join me as I feared something going wrong. I did not want the responsibility of caring for anyone else. I just wanted to walk and think for days on end. Africa was the obvious choice as it was the place that was familiar and a place that I had grown to love. The highest point of Uganda, Mt. Stanley, was the obvious choice as this mountain did not pose any crowds or any technical difficulty. What it did pose was a challenging approach. It was like doing a Spartan race before the obstacle course race was invented…..this was one tough mudder! It was wet, muddy and cold but it offered everything I needed; complete peace and solitude for days. The summit served up a sweet victory as over my right should was the Congo and over my left was Uganda. It had everything I wanted except a partner to share in the joy. Lesson three was coming into view. It was on the top of Margarita Peak that I learned, a summit without a friend to share in the experience, it not a joyous moment. This article has been a long way of expressing why all roads led to climbing Mount Mawenzi. It was just a few days after coming off Mount Stanley that I realized I had reached four of the five highest points in Africa. When I questioned which mountain I was missing, imagine my surprise to learn that it was Mount Mawenzi. Again with my husband’s support, we immediately wrote to the African government and built a very solid case for them granting us an exception to climb Mawenzi. How could they deprive me of getting the top five highest points of Africa? Their reply was as before a resounding NO! The mountain remained closed. Each year we wrote in for permission to climb and each year we were disappointed to receive notice that it remained closed. It wasn’t until 2017 that our shameless begging resulted in a permit. It was a go yet one problem, Brad was guiding a group to Kilimanjaro and did not have the time to do two mountains. I had a permit and no partner. If I did not find a way to go, I risked that it would once again close. With the many lessons above swirling in my head, who would I be willing to go to the moon with me if it were not my husband? Who could I count on to hold it together to embark into the unknown? Who would go to the other side of the world to try something that had little chance of success? Who would go all that way and choose to climb what pales in comparison to the grandiose beauty and scale of the much-coveted Mount Kilimanjaro? The answer will be revealed in Part 2. Can’t wait for part 2! What a great read. Previous PostPrevious Jubilant Song. A climbing adventure in Red Rock Nevada.